Pu-erh is traditionally ‘rinsed’ before being steeped. This is done with a quick application of hot water that is poured over the tea in the gaiwan or teapot and then immediately discarded. The rinse water is not drunk – its purpose is to help the leaves begin to open during steeping.Use additional appropriately-heated water for the 1st steeping and subsequent re-steepings. Loose-leaf shou Pu-erh is a very practical and easy way to enjoy Pu-erh on a daily basis without the formality of beeng cha preparation. 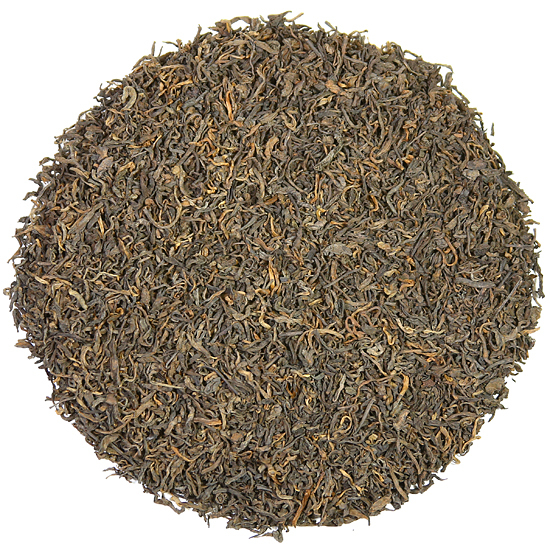 It is an easy, low-commitment and delicious way to become familiar with the world of Pu-erh. This Aged Shou Pu-erh is round, smooth and rich in taste with a clean, sweet finish.